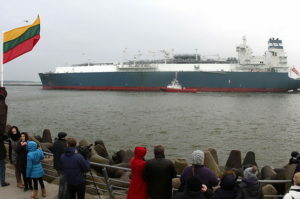 Lithuania intends to redeem prematurely the base LNG terminal ship from Norwegian company Hoeg LNG, operating at the Klaipeda state seaport on the Baltic Sea. According to the local government, the purchase will save 15 million EUR to the government, which is part from modernization and restructuring of the state-owned maritime transport. The mobile LNG terminal in Klaipeda port was commissioned in December 2014, which is part of the introduction of the object into operation in the tariff cost of gas for consumers included an additional fee for construction and maintenance of the terminal. It cost Lithuania 101 million EUR and annual rent of 61.446 million EUR for 10 years. According to contract, just after that the government has rights to purchase the base LNG terminal ship. “Early redemption means annual savings of 15 million EUR”, said the Lithuanian Prime Minister, Algirdas Butkevicius. “For Lithuanian consumers, this would be turned into a decrease in the price of natural gas”, added he. The discussions about prematurely purchasing of the mobile LNG terminal in Klaipeda will be discussed on during the visit of Lithuanian Prime Minister in Norway. He will meet with representatives of the supplier of liquefied natural gas company Statoil and Hoegh LNG. Experts doubt that the Norwegian company will “abandon the goose that lays the golden eggs” and agree on such early sale of the vessel to Lithuania.